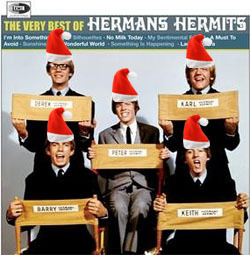 OK, My Sentimental Friend, I've been Bidin' My Time till Christmas got here so I could wish you all a Merry Herman's Hermits Christmas. Wouldn't that be Dandy? And I hope You Won't Be Leaving until I get it done. The joy of Christmas has been the Story Of My Life, keeping me from being Little Boy Sad. If You're Thinking What I'm Thinking, you know Christmas is often sad for many people. To them, it's truly A Must To Avoid. Well, I Understand (Just How You Feel), but still I'll do it For Love, because I always believe things can always be Just A Little Bit Better. I know the basic message of Christmas is meant to Make Me Happy, and you too, and that we truly live in a Wonderful World. My Lady, the Virgin Mary, Just One Girl, heard the good news: Something Is Happening, with the word coming on Wings Of Love. At first, Joseph heard what she said and thought it was The End Of The World. He pictured her and some other guy as Silhouettes on the window, and said, "I Gotta Get Away!" But she pleaded, "I've Been Walkin' With My Angel," to which he replied, "Don't Try To Hurt Me." Then finally he said, "OK, Tell Me Baby. Otherwise I Can Take Or Leave Your Loving." She defended herself, saying this was the Son of God who would be born, and now Joseph had to judge What Is Wrong, What Is Right. He told her he'd Dream On it that night. "I'll pray the Lord to Show Me Girl." Then he heard the word from on high, that Mary was indeed no Jezebel, and declared, "Now I Know Why." They went to the town of Bethlehem, to an inn. At first Joseph thought, "My Reservation's Been Confirmed," but as it turned out, this was no Holiday Inn. They tried to check in, but the innkeeper, The Man With The Cigar, told them there was no room, not Upstairs, Downstairs. He pointed to the exit, as if to say, "This Door Swings Both Ways." Outside, they found a little stable at the end of Gaslite Street, barely fit for a Rattler (or even your Mother-In-Law), let alone the Son of God. Mary pondered these things in her heart, thinking, "I Wonder..." Joseph turned to the Big Man above, complaining, "Where Were You When I Needed You?," but suddenly he Got A Feeling that It's Alright Now. Finally, Mary gave birth to her son, and patted his little head and said, "Oo-Ee-Baby ... All The Things I Do For You Baby ... You're The Most Beautiful Thing In My Life." Suddenly they saw a flash and looked up at the sky: Here Comes The Star! It's a thrilling story, isn't it? ... Can't You Feel My Heartbeat? I hope you agree, that today, for us, Years May Come, Years May Go, but the whole world can still know that God's been Thinkin' Of You. Each one can have a Merry Herman's Hermits Christmas and make it a beautiful time to Take Love, Give Love. And each one can agree with everyone everywhere, and know, I'm Into Something Good. Tonight, this Christmas, let it be just like that first night: There's A Kind Of Hush All Over The World. So Smile Please, because I'm wishing you a great Christmas! You Bet Yer Life I Do.